Q Can I take a tag through airport security? Yes, NFC tags meet the International Permitted Items for airport security. Q Will the tag interfere with a hearing aid? There is no interference with hearing aids, vagus nerve stimulation devices; whether the tag is in use (being tapped by an NFC smartphone) or not in use; on your wrist or in your wallet. Q Do the products work abroad? Tap2Tag works anywhere in the world where a mobile device can get access to the internet or there is a computer with access to the internet. Q Can I buy a Tap2Tag product for somebody else? A You can buy a tag for another individual; whether you're purchasing it for them as a gift or buying it to manage that tag for the individual (e.g. child). The device will appear within your account until such time as you decide to give the device to someone else. When you are ready go to Devices & Profiles within the My Account section. Click on My Devices to show the devices held on your account. Find the device you want to give to someone else and press the "Transfer Device" button. This will then send an email to that person asking them to accept or decline the device. If they accept then the device will disappear from your account and appear on their account. If you have a profile attached to the device at the time of the transfer the profile will automatically detach itself from the device. This means that when the device appears of the other person's account there will be no profile allocated to it. They can then attach their own profile. Q Where can I buy Tap2Tag devices? A Currently, Tap2Tag devices are exclusively sold on our website Tap2Tag.me. In the UK you can also buy them from Amazon and Argos as well as a number of independent shops around the country. We also have distributors in Canada and South Africa. A All of the products are waterproof as the RFID chips are enclosed in waterproof materials. The wristbands are made from a waterproof resin and have been tested during a scuba dive to 29.5m. Q Where are Tap2Tag products manufactured? A Virtually all RFID and NFC products are manufactured in China. As a result the products we sell on the Tap2Tag.me website are all sourced from our suppliers in China. Tap2Tag Limited is a company registered in the United Kingdom and regulated by the laws and tax regime applicable to the UK. Q Where will it work? A Our Tap2Tag devices can be scanned anywhere where there is an internet signal on your NFC device or on a computer with access to the internet. Q What happens if my tag breaks? A If there is a fault with the device within 12 months of purchase then you can return it to us (see our returns policy). Q Do I have to pay a subscription? You do not require a subscription to use Tap2tag. Our current subscription model for medical profiles include SMS alert messaging, document upload and allows you to create a 5th medical profile if you already have 4, increasing the limit of medical profiles from 4 to 5. Subscription costs £20 a year and is paid annually. Q How long will a tag last? A This is all new technology so the extent of the tag's life has not yet been calculated. Of course we give a 12 month guarantee for all items sold. We have been informed by our suppliers that the life of a tag is at least 5 years. Q Who can use it? A Anyone can use Tap2Tag. 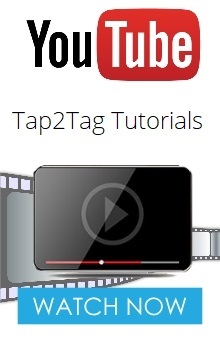 Once you buy a Tap2Tag device you can set up your own profiles to assign to it. If you want someone to tag your device, they will need an NFC enabled phone (see NFC phones). However people can still see your profile by going to www.tap2.me and entering the unique code printed on your device. This can be accessed using any device with access to the Internet. Q How can I test my Tap2Tag device? You can test your Tap 2 Tag device by first enabling NFC on your smartphone. Hold your smartphone to the Tap2Tag logo on your tag. If you have already registered your tag, your medical profile will open in your phone's internet browser. If you have not registered your tag, the Tap2Tag homepage will open in your phone's internet browser, where you can begin the registration process. If you tap your phone against your own device and sign in to your Tap2Tag account, no email or text will be sent if your device is registered to your own account. If someone else accesses your device with their own Tap2Tag account and you have chosen to send a text message to your ICE contacts via SMS then a charge may then apply.